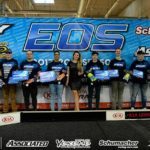 his past weekend we traveled to Warsaw, Poland for Round 1 of the 2017/18 EOS series. The surface was different from anything I had ever run on before, the track was challenging but fun. We had spent a couple days practicing at the HUDY arena with the team and got my cars on pace but getting used to the driving style was the most difficult part, it was a great learning experience overall. 2wd qualifying didn’t go as good as I wanted so I was only able to qualify 7th , in the triple A mains I was able to get good starts and make my way through the pack and was able to finish 3rd overall to join my team mates in an all Xray podium. In 4wd, qualifying went pretty well and I was able to qualify 3rd, in the triple A mains I would have some troubles in the first two but for the third one I was able to finish second to salvage a 4th place finish overall making it a 1st through 4th for Xray again. 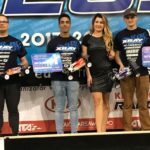 Congratulations to Bruno for winning both classes and to team Xray for sweeping the mod podiums.